Utilising a bespoke mezzanine flooring or storage service for retail applications is a very sensible investment. Mezzanine can be used in shops to increase storage space to hold extra stock or to expand on the amount of stock that can be held. This not only allows you to stock more products, it also allows you to give a better customer experience to your customers. The use of mezzanine for retail also extends to the use of mezzanine in a warehouse. The stockroom of your shop can be expanded to hold a second floor or additional storage area which serves to let you offer additional stock and higher numbers of specific products. The hassle of moving offices or premises is often a costly and disruptive process. Utilising office mezzanine floors allows you to create space for new offices in a variety of locations. you can create additional space in an already established office area, in a warehouse or industrial area or for any other type of main business premises. These mezzanine floors are created, bespoke to your specific requirements. Building work being carried on your office area can be extremely disruptive and may inconvenience your workforce. Mezzanine floors, on the other hand, are faster and less hassle to install than extensive building work and can be designed to your exact specifications and requirements. Perhaps one of the more common applications of mezzanine flooring is to expand or build upon a warehouse storage area. 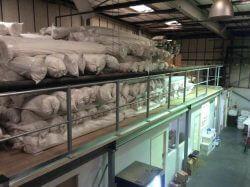 Should you require more space to hold stock or other equipment then you can install a mezzanine flooring system. These can also be provided with additional safety features such as handrails and edge protection. Using the space that you have available rather than purchasing an additional property for storage purposes is a very sensible investment that can save massively on costs to your business. Should you have to move premises to increase capacity then this can also incur huge costs and inconveniences to your workforce. Using mezzanine floors to increase the space that you have available is a cost-effective way to solve the issue of having restricted space for your business. The October edition of our blog investigates how you can expand your floor space quickly and effectively with a mezzanine floor. In our previous update, we discussed how using mezzanine flooring to expand a warehouse storage area is one of the most common applications. This application is very useful for a cost-effective expansion of your warehouse especially if you are facing having to expand and buy a second premises for storage purposes. Building on this point, the speed of installation is key in the success and practicality of using a mezzanine floor for your warehouse. Another great benefit that is associated with utilising a mezzanine floor for your warehouse is that you do not require planning permission to construct your mezzanine floor. As this is installed internally your mezzanine floor just needs to conform to building regulations in order to be installed in your workspace. Your new workspace isn’t just limited to storage. If you find that your workspace is becoming overcrowded or you require additional areas for workers to operate within then you can look to install an additional mezzanine floor. This allows workers to get on with the task at hand instead of having to worry about overcrowded working areas. 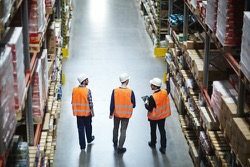 If you are using your warehouse for industrial applications then overcrowding of the warehouse floor can also pose a safety risk. Installing an additional mezzanine floor allows you to increase the amount of working areas for your workforce to reduce overcrowding of your workspace. Working with you and your team, we will examine your premises to ensure that you have the mezzanine solution that solves all of the issues that you may be experiencing. Should you be considering mezzanine floor solutions for your business then QA is the ideal company to consider. Whatever you require from your mezzanine floor, our expert team will ensure that they know your exact requirements. The site survey that they will carry out ensures that every detail is accounted for before the design process of the structure begins. This design process takes into account every detail that is required to create a mezzanine flooring solution that is ideal to your business. As an independent company, we offer a wide range of technical knowledge as well as resources which you can expect will be available to you. The nature of our approach changes according to the nature of the job and the budget of your project. This offers you a solution that is perfectly suited to your requirements as well as fitting into your budget. Our installations demonstrate expert care with detailed planning to ensure that every single aspect of your project goes as smoothly as possible. In both the design process and the installation service, our team will carry out detailed planning with expert care to ensure smooth sailing for your project. Not only do we provide this, we also ensure that your project is completed on time and on budget. Should you be considering mezzanine floor solutions for your business then enquire with the team at QA today. The August Edition of our mezzanine floor blog discusses additional benefits of using a mezzanine floor as a storage or space solution for your business. With the range of styles that are available, your mezzanine floor will look fantastic as well as being available in a wide choice of colours. This shows just how versatile this flooring and storage solution really is as you can match your mezzanine floor to your working premises. Whether you want to match your white office with a white mezzanine area or want to install an acrylic black mezzanine floor in your industrial factory area, you are able to match the colour of your premises with our mezzanine floor solutions. As the design options for your mezzanine floor are very flexible, there’s a great deal of applications for your mezzanine floor and you can use them for many different types of premises. As your mezzanine floor can also be uninstalled and reinstalled, it’s possible to move premises and still enjoy the practical design benefits of your mezzanine floor. One of the other major advantages of your mezzanine floor is that there are excellent safety systems available and installed as standard. Whatever you need from your mezzanine floor, QA are able to carry this out and take every account into detail. We offer gate systems, stairs, edge protection and safety equipment as standard akin to your requirements. There’s excellent fire protection available with your mezzanine floors also which leads to storage areas being secure and safe from threat of fire. For storage solutions, your mezzanine storage solution is highly secure as well as offering you a vast amount of practical space that you may need for your business. We’ve discussed the ways in which many sectors can expand their working area by using mezzanine flooring as you are able to increase the working area of your office or industrial premises. Making life much easier for your workforce is often very important, with this being easily possible with the installation of a mezzanine floor. Expanding working spaces often hides underlying costs and disruption which as mentioned, can demoralise or disrupt work patterns and completely negatively affect productivity of your workforce. A mezzanine floor is a one time payment with fast installation times, limiting the costs and time it takes to expand your working area. A lot of the potential working area in your office or warehouse may not be being used at present which means that you are not making the most out of your premises. Mezzanine solutions can change that, ensuring that you are using the absolute maximum workspace that is available in your business premises. If you feel that you require more space for your business and that you may benefit from our mezzanine floors then it’s highly advised to contact QA Workspace directly today. We can help you install your ideal mezzanine solution and offer you all of the practical and excellent benefits that mezzanine has to offer.